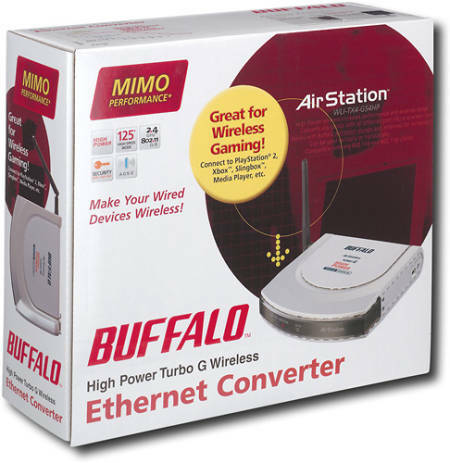 If you found yourself in the same situation I was in recently, in which you have multiple internet-ready entertainment devices in your living room, I’d heartily recommend another recent purchase, the Buffalo Ethernet Converter . This device will allow you to connect up to four ethernet-based devices, such as Xboxes, PS3s and Series 2 Tivos, to a single device which then connects to your wireless network. Purchasing a single wireless adapter for multiple devices is the cheapest route, especially when you can find the Buffalo Ethernet Converter for $69.99 , while single-device products, such as the official Microsoft 360 run around $99. The device works with all major wireless routers, regardless of brand, making this the easiest way to connect your living room to your wifi network at the lowest cost possible.